Colbert was spoofing reports that the current financial crisis was resulting in higher borrowing rates at libraries which were having a negative impact on market capitalism by providing free books and internet use. 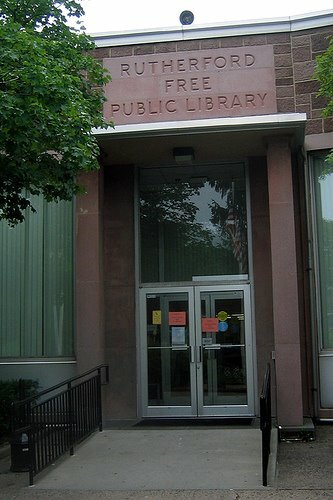 Colbert’s segment called “Communist Library Threat” was filmed at the highly regarded Rutherford Free Public Library and featured Jane Fisher (Library Director) and Arlene Sahraie (Library Services Director). I’ve known and respected Jane Fisher, a Library Journal “Mover and Shaker,” for several years, first meeting her when she was at the New York Public Library and asked me to do a workshop on:“Everyday Assessment” for librarians (see more on the Library Journal blog post from 10/13/08). Several years’ running, Arlene Sahraie has been my worthy opponent, as a member of the “Library Goddesses,” in hot competition against my team, the “Alumni Avengers,” in the annual “SCILS Bowl” trivia championship at Rutgers. The clip features first Arlene and then Jane in dialog with the overdubbed and menacing voice of an unseen Colbert, who interrogates them on library policy for providing free resources. He urges viewers to take out library books, not return them, and pay the fee for lost books in order to set the free market back on track. Thanks to Jeff Teichman, of the Rutgers University Libraries and MLIS student at Rutgers SCILS for sending me the URL. Entry filed under: Public libraries. Tags: Colbert Report, Rutherford Public Library, YouTube. Works fine for me and it’s hilarious! Thanks for posting it, Marie.